Who looks at the financials? Any financials? I suspect that most people who complain about White Hat have never examined the financials of their own public school district. This isn't really about disclosure, or accountability. "Evidence establishes that the finance system must be revised to assure that funding is rationally related to the actual costs of providing a thorough and uniform system of public education. It is also apparent that increased funding will be required." The Court has given the Governor and the state legislature until the end of the 2012 legislative session to come up with a fix. Without even attempting to read or understand this case (I'm not a lawyer), I'll assume that that the arguments in this Colorado case have little difference to those raised by DeRolph v. State of Ohio, which was filed almost exactly twenty years ago. DeRolph was the school funding case that made it to the Ohio Supreme Court, which declared the public school funding system then in use to be unconstitutional. Most people mistakenly believe the Supreme Court declared the use of property taxes to fund schools to be unconstitutional, but that's not at all what they said. Regardless, DeRolph is now moot, as the General Assembly has enacted two different funding systems since then, and neither has been test by a lawsuit. It looks like Colorado might be the next state to go down this road. Lobato will undoubtedly be appealed. If it isn't, and their legislature doesn't satisfy the Court's order, it will still raise the constitutional question as to whether the legislative branch in their state can be ordered to do anything by the judicial branch. Both states have similarly vague, and not very useful constitutional standards in regard to public education. Ohio's Constitution talks about a "thorough and efficient system of common schools" (Article 6.02), while Colorado's says "thorough and uniform system of public education." It will be interesting to watch the Colorado case as it progresses. Lots of people would like to know how much a public education should cost and how it should be funded. So how would we go about figuring that out - what Judge Rappaport called "actual costs" - and where should the money come from? It seems to me that we first have to go back to the fundamental fact that 80-90% of the money spent on public education (88% in our district) goes to pay for the compensation and benefits of the teachers, staff and administrators who are employed by the school district, and most of that is spent on the teachers. I'm not saying that's a problem. As long as educational services are delivered primarily by teachers in a classroom, that's where as much of the money as possible should be spent. Everything else should be viewed as support for what happens in the classroom, or as "extras" above and beyond the State requirements. But how much should teachers be compensated, and how many of them should we employ (in relationship to the number of students)? The notion of Governor Strickland's "Evidence Based Model" funding approach was that there are clear answers to those questions. The EBM specified how many teachers there should be, and how much they should be paid - at least at a minimum. It also specified how many folks we should have in key administrative and support staff roles, and also what they should get paid. Here is a copy of our district's PASS report, the document which shows how a school district was funded under the EBM approach. Page 2 of the report spells out how many people we should have in specific job categories. For example, lines 6-12 detail the minimum number of teachers we should have in various categories. The State would then give a district $56,902 of funding per teacher, adjusted by the "Education Challenge Factor," which is essentially another measure of how affluent a district might be. Our ECF was .98509, meaning that the State's contribution would be adjusted to $56,902 x .98509 = $56,054. This $56,054 is supposed to cover both compensation and benefits. In our district, the average teacher compensation is $69,369 plus 35% in benefits, or $93,648. So the EBM would cover only 60% of the cost of one of our teachers. The other 40% was our local contribution beyond the State funding. Of course, Gov. Strickland's EBM was never fully funded, nor was the system it replaced. In the case of Hilliard Schools, and most school districts like ours, the changeover from one system to the next had virtually no impact on the amount of funding we received from the State, due to the effects of the so-called Transitional Aid Guarantee. Any change in the school funding algorithm creates winners and losers. Since the objective of such a change is always to get more money to the poorest of Ohio's school districts, the winners are usually those districts while the losers are districts like ours. The Transitional Aid Guarantee came to be to prevent there being any such losers - a matter of political expediency rather than good policy. 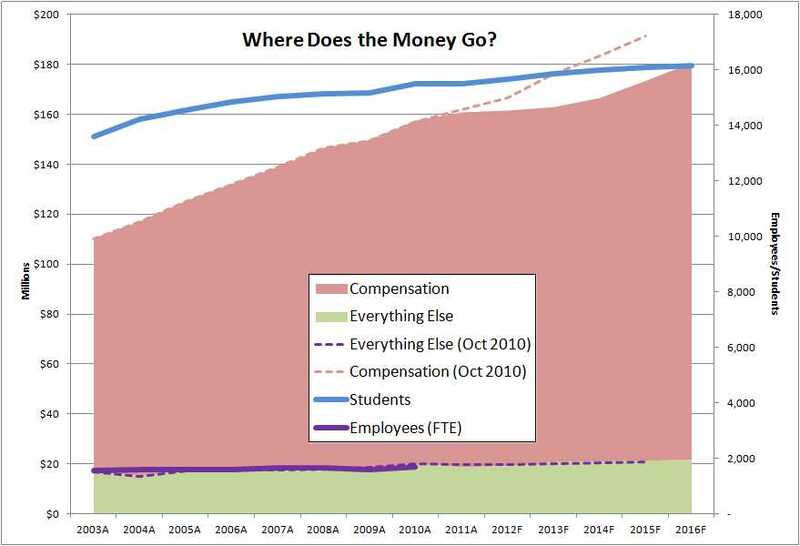 So if 80-90% of the spending in a school district is on compensation and benefits, is there any data which helps us figure out how many folks we need on staff, and what we should pay them? How about if we go back to the philosophy of the Empirical (Augenblick) Method, which was the approach used from the early 1990s until it was replaced by Strickland's OEBM in FY2010? Only this time, let's use only the 81 districts rated as "Excellent with Distinction" in 2009 as the sample set. The Augenblick Method is to list the per-student spending of the school districts in the sample set, throw out the lowest and highest 5% or so to eliminate outliers, then average the rest. With this algorithm and using 2010 per student spending from the CUPP report, we get $10,026/student as the benchmark number, . In other words, we don't know how exactly a district should or would spend the money, but it seems like with $10,026/student, any district should be able to achieve a rating of "Excellent with Distinction." Yet the actual range is quite large. Throwing out the 4 high and 4 low districts (5%), the per-student spending still ranges from $14,733 at Sycamore Schools (Hamilton County) to $7,949 in Wausean Schools (Fulton County). So why can't Sycamore Schools get the job done at $8,000/student/year like Wausean - close to half the cost? As said before, it's all about how many people the school district employs, and what they are paid. At Sycamore, the ratio of Regular Education Teachers to Pupils is 17/1. At Wausean, it's 21/1. The average Wausean teacher has 24% more students in the classroom than a Sycamore teacher, yet they both achieve the same rating. So do the Wausean teachers get paid more for achieving the same result while having larger classes? The average teacher salary in Sycamore is $71,137, while in Wausean it's $55,668, meaning Wausean teachers have 24% more students in their classes than Sycamore teachers, but get paid 22% less. So it's not class size or teacher comp which determines the rating on the State Report Card. How about teacher experience? The CUPP report gives the percentage of teachers with 0-4 years of experience, 4-10 years, and 10 or more years. For Wausean, those statistics are 14%, 19% and 67%, respectively. For Sycamore, it's 14%, 17% and 69% - nearly identical, and both skewed to the higher experience band. 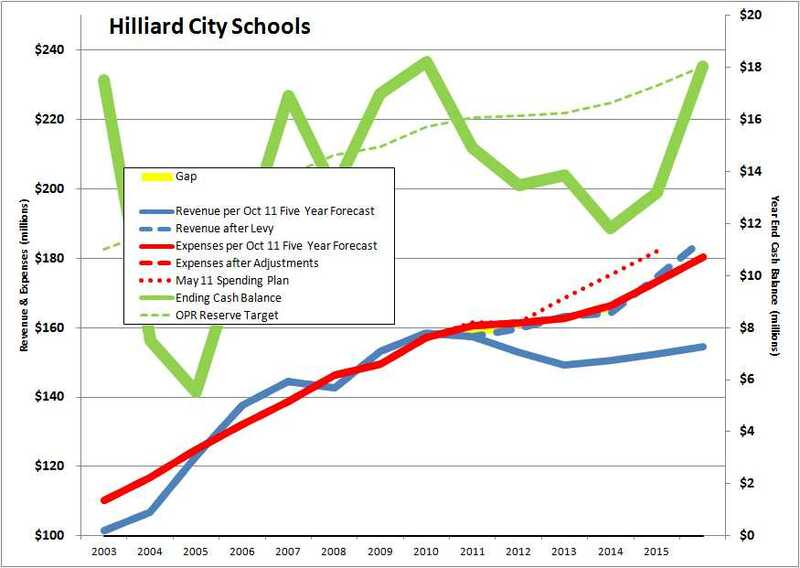 That would certainly suggest that experience makes a difference in terms of results, but doesn't explain compensation differences between districts (Hilliard's numbers are 12%, 22% and 66%). I should stop here and remind folks that correlations are not the same thing as "cause and effect," and that merits remembering here. There are within this dataset school districts which achieve Excellent with Distinction yet have fewer than 25% of their teachers with 10+ years of experience. Twinsburg for example achieves this rating while having 60% of its teachers with 0-4 years of experience. So is there anything we measure which seems to be a strong predictor of outcome? I'd suggest that there is, at least within the constraints of the data published in the CUPP report. That predictor is the level of poverty in a school district. Among the 81 Excellent w/ Distinction districts, the average and median number of students living in poverty conditions is 22% (stdev=13). As poverty goes up, performance goes down, and it doesn't matter that much what the per-student spending might be. For example, Columbus City Schools spends $14,904 per student, second in our area only to Grandview Heights, which spends just $74/student more. Yet the Performance Index for Columbus City Schools is only 80 (2009 data) vs Hilliard's 101.5, which we achieve while spending $3,400/student (23%) less. The difference: 80% of Columbus kids live in poverty, while 21% of ours do (I suspect that number is surprising large to many in our community). So how do we determine how many folks we employ in our school district, and what we pay them? The best answer I can come up with is that it's all a matter of local choice. Across Ohio, teachers are paid according to what their local union negotiates with the local school board, and it seems clear to me that local school boards in more affluent communities tend to settle the labor contracts at higher salaries than do those in less affluent communities. That's about it. So it behooves a young teacher to get hired in an affluent district like ours, or one of the many suburban districts around Ohio. Presumably those districts can be very selective in their hiring, so only the most promising young teachers get a job. In our district, new fulltime teachers typically serve as substitutes for a year or more before being hired. It's an effective way to give them a 'try-out' before being invited to join the team, and I've been impressed with the new crop every year when we get to meet them. It must be a valued opportunity, as we have literally thousands of applicants each year for dozens of openings. Does that mean the tens of thousands of teachers in the less affluent districts are all duds, because they couldn't find jobs in districts like ours? Certainly not! Many things will cause a young teacher to live in a less affluent community: family, spouse's job, lifestyle preferences, etc. And there are districts that achieve Excellent w/ Distinction in spite of having very low teacher salaries. Bloomfield-Mespo (Trumbull) is such an example, with an average teacher salary of $37,751, less than the starting salary in our district of $38,362. And the 'how many' part of the equation is a matter of local choice as well. We choose locally the overall student-teacher ratio. We decide locally the breadth of programming we wish to offer, and how those programs will be staffed. You may respond that YOU don't get to make those decisions. But that's a cop out. You elect the school board members, and you should hold us accountable for making decisions consistent with your wishes, understanding that there will never be 100% agreement on anything about anything. Your input makes a difference. Input from a lot of you makes a big difference, and can change the direction of important decisions. We've seen that a couple of times this year. It will seem like we're entering a 'quiet' time right now. We have a workable agreement with the teachers and support staff through 2013. With your passage of the levy, we are committed to not putting another levy on the ballot before 2014 - provided the State doesn't hammer us with another significant funding cut. Indeed we can take a little breather. But I feel strongly that we soon need to start the community education and communications effort to prepare us for 2013, when we'll next be negotiating with the teachers and support staff, and for 2014, when we'll be voting on the levy to fund that new contract. The basics of school economics aren't difficult to understand, but we have lots of people to educate. HB136 is currently working its way through the Ohio General Assembly. This Bill creates the "Parental Choice and Taxpayer Savings Scholarship Program," also known as PACT. The core purpose of this legislation is to allow parents to redirect the money the State of Ohio sends to the local public school districts to properly approved private schools. Some school boards have recently chosen to pass resolutions in opposition to HB136. The Ohio School Boards Association, of which our School Board is a member, is lobbying in opposition to HB136. I recently read through the Bill Analysis, prepared by the Ohio Legislative Services Commission, a body appointed by the General Assembly to render non-partisan, independent views on proposed legislation. The general notion of this legislation seems pretty good to me. And I can't believe what I believe about the importance of free markets and competition, or write what I have written about school choice, and be opposed to the principles of this Bill. But it still needs some work. My friend Marc Schare, who is also current President of the Worthington School Board, submitted written testimony to the House back in April. I agree with much of what he said. The Bill in its current form specifies that parents could apply to have up to $4,563* subtracted from the funding their local school district gets from the State and redirected to a scholarship account which could in turn be used to pay tuition and other expenses to an approved non-public school. The intention is that the school district would retain all the funds it raises from local sources - primarily homeowners and businesses - but that the money provided by the State could be used to pay tuition at a private school. The problem, as Mr. Schare points out in his testimony, is that not all school districts receive $4,563 per student from the State. The amount of funding a school district receives from the State is determined to a large degree by the affluence of a community, as measured in terms of property value. By this measure, we are a fairly affluent community, and consequently our State funding was reduced to $3,741 per student in FY2010 (see CUPP Report produced by the Ohio Dept of Education). This means that if a student were to take $4,563 with him to a private school, we would have to send along the $3,741 of State funding we receive, plus $822 that we have raised locally through tax levies. Mr. Schare says this is inappropriate because the people of the community voted to be taxed that amount of money in order to fund their public school district, not to have it diverted to a private school. I see his point, and agree somewhat. But here's where one's perspective is important. From the perspective of folks with kids in the public school system, this sounds like their money is being taken away to subsidize kids in the non-public schools. From a practical standpoint, one of the more significant challenges with HB136 is that it allows PACT money to be withdrawn for students already attending non-public schools. So if we have 1,000 kids in our community currently attending non-public schools (I don't know the real number), it means we aren't currently allocating any resources to educate those kids, but we could still have as much as $4.6 million of our State funding diverted. Same number of kids, $4.6 million less funding. That's equivalent to about 50 teachers. But from the perspective of the folks with kids in non-public schools, it means an end to having their tax dollars being taken to fund the public schools their kids don't attend. This has always been an issue with the families who send their kids to the Catholic schools for example - they feel like they're paying for both the public schools and their parochial schools. For these folks, HB136 seems pretty fair. We also have to remember that it's unlikely that any of the votes taken to approve public school levies were unanimous. There might have been a fair number of people in the community who voted to NOT send additional funds to the public school district, but are required to do so anyway because the majority dictates to the minority when it comes to levies. I recognize that this argument stands on shaky ground. The rule of our democracy is that the majority wins, even when the margin of victory is only one vote. This is one of the challenges of democratic capitalism - knowing when to let individual choices and appropriately regulated markets determine how resources are allocated, and when we should allow majority-wins elections to decide the outcome for all. I prefer the former whenever practical. That's my core reason for saying what I did in Food Stamps - that we should operate our schools like we do our food distribution system. Our society has set up a food production and distribution system which is the envy of the world, and one of the key drivers is the ability for any shopper to buy whatever food they want, wherever they want, and at whatever price they find acceptable. The competition for customers drives producers and retailers to create fantastic choices at prices the market will bear. But instead we fund our schools like the Soviets ran their food distribution network - government control of what was produced and in what quantity, and where it was distributed. Their food may have been free or nearly free, but there were massive shortages and the food was generally of poor quality (no, I'm not saying our school district is of poor quality - we all know it's quite the opposite). And of course the black market thrived, but only for those with the means. The majority of the population just had to suffer. We think food is a pretty important component of life, so for those who can't afford to buy sufficient food, we provide a taxpayer-funded public assistance program we call "food stamps," even through the little books of coupons haven't existed for a number of years. We could organize our education system in the same way - most people would pay tuition to the institution in which they wish to enroll their kids during the years they were in school, and otherwise be off the hook. For those who can't afford a "thorough and efficient" education, as required by the Ohio Constitution, we would have a tax-funded scholarship program, akin to food stamps. No one who wants it would go without an education. I recognize that such a radical shift in thinking is not in the cards, at least not for the near future. HB136 has some good ideas, but has not been sufficiently thought through, as was the case with SB5. It will further stress the public school districts without having practical, workable solutions to the real problems it will create. * The actual amount of the scholarship available to a student is reduced as family income increases. The full $4,563 is available only to families whose combined income is less than 278% of the Federal Poverty Level,. For a family of four, this means the full scholarship amount is available only if the combined family income is less than $62,000. No scholarship money is available when the combined family income is more than $95,000, so this isn't a way to help pay the tuition for rich kids at expensive private schools. I'm happy that our community passed the levy issue, albeit by an extremely slim margin. I've come to view levies as the mechanism which the School Board uses to facilitate a negotiation within the community. There is not now, nor will there ever be a time when every single voter in our community agrees on exactly how our schools should be run, or what it should cost. It will vary depending on whether the voter has kids in school, on the voter's financial status, on the voter's political philosophy, and a myriad of other personal factors. So I look at a levy issue as more of a proposition, explaining what will be offered if the levy passes, and what will happen if it fails. If a majority of the voters accept the proposition, the levy passes. If not, it fails. What should happen if a levy issue fails? I think that when that happens, the School Board should adjust the proposition and ask again by putting a new levy proposition before the voters. I think this because not putting a levy on the ballot denies folks a chance to accept a different proposition. That doesn't mean that if a levy fails I advocate running a levy at every single opportunity following until one finally passes. I think that would annoy the community, and unreasonably burden the emotional, physical and financial resources of the levy campaign team. I think there's a better way to go about this - more later. In this case, the community rejected the proposition offered in May, but accepted the proposition offered in November, which included the commitment to not ask for more money until 2014 at the soonest (but we have to be realistic and say that we might have to revisit that if the State of Ohio makes further significant cuts to our funding). As has been the case for years, 88% of our spending is on comp and benefits, which is as it should be. It's also the only part of the budget which is growing materially. That's good too - it indicates that the 'overhead' part of spending is being held constant. Notice that the projected spending for Compensation and Benefits for future years is well less than it was projected to be just a year ago - by about $18 million in FY15. This reflects the terms of the new agreement with the unions for 2011-2013 - including the projected impact of the early retirement incentive program for the teachers and additional contribution toward the health insurance premium. It also assumes a resumption of annual 4.15% step increases in 2013 (which is effectively 2.3% given the mix of teachers on and off the step years), but with only 1% base pay increases starting 2014. Since the most significant of the budget, and the only part that's growing is comp and benefits, that's where we need to focus our attention. So what drives up the cost of compensation and benefits? Clearly, the most significant driver is whatever gets negotiated into the teachers' contract in terms of the salary grid. If you're not familiar with how this works, I recommend that you read an article I wrote titled Teacher Salary History. Their current contract runs through 2013, and I don't anticipate engaging in negotiations again until then. So in regard to teachers and staff, the labor rate is set, but that's only half of the equation. The other half is the number of teachers and staff we choose to employ. At the end of FY11, our district employed the equivalent of 1,716 full time employees, 1,117 of whom were teachers. The remainder includes 202 pupil and teacher support staff, 131 building and grounds maintenance personnel, 125 bus drivers and other transportation staff, and 108 administrators (source: 2011 CAFR, page 110). So what determines the number of teachers we employ? It depends on the grade level. At the K-5 level, it's mostly about the number of students we want to have in each classroom. As you can see from the monthly Enrollment Report, the overall K-5 ratio is 23.6 students per classroom. When you get to the high schools, the variety of course offerings also becomes a driver. Our high school catalog offers over 300 courses, although not every course is offered every semester. Some classes are pretty large, with 30+ kids, and some - such as our new Chinese foreign language offering - have single digit enrollment. Overall in our district, the student-teacher ratio is 22.5/1, while the average for our region is 25/1, and that ranges from 18/1 in Upper Arlington and Bexley to 35/1 at Groveport-Madison. If we increased our student-teacher ratio to 25/1, our need for teachers would diminish by 70, which could reduce our spending by about $3.5 million per year (assuming junior teachers averaging $40K+benefits). We have a unique opportunity to do such a thing in the coming year, with potentially a large number of teachers retiring to take advantage of the early retirement incentive program. It's an opportunity to adjust staffing levels without layoffs, and that must not be ignored. In addition to their normal pay, many employees of our district also receive stipends and supplemental salaries. Once again, these rates are set in the union agreements, but there is a choice as to how many of these roles will be funded each year. As is shown on the agenda for Monday's School Board meeting, we will be considering a resolution to authorize stipends for the 2011/12 school year for about 1,000 roles, ranging from $350 each for the 182 participants on the School Improvement Teams ($64,000 total cost), to $1,200 per semester for supervising the high school weight rooms (12 person-semesters/yr for Davidson, 3 each for Darby and Bradley), adding up to about $22,000 each year. The total outlay for all stipends will be more than $600,000 next year. The resolutions to approve supplemental salaries are dealt with a couple of times during the year. A complete list of these are included in Appendix L of the teachers' contract, starting on page 94 of the Master Agreement. These are expressed as a percentage of the base salary for each teacher, ranging from 15% for the head football, basketball and wrestling coaches, as well as the head instrumental music directors, to 5% for an assistant drama director or an assistant middle school tennis coach. Administrative contracts have terms of varying terms and expiration dates. You'll see these come before the Board for action at the appropriate times. My opening statement was to describe levy issues as the way the School Board facilitates a negotiation within the community. I also think it's an extraordinarily inefficient way of accomplishing this task. We have lots of things to talk about in regard to our community and our schools, and with the passage of this levy, we've bought some time to figure out a better way to get this done. My suggestion is that we use a process that has worked pretty well for us over the past few years - a large committee (~100 members) of diverse viewpoints called together to deal with a challenging question. It has been used for adjusting attendance boundaries when Bradley and Washington were built, for looking at student housing alternatives, and most recently for developing an approach for Pay-to-Participate fees. What do you think of that? Would you participate? I'll write about my thoughts on the election when I've had a chance to digest the numbers, and we have a final tally on the levy. Meanwhile, feel free to post thoughtful comments here, but be forewarned that I'll not publish comments I find to be hateful, which make personal attacks, etc. Conventional wisdom concerning school levy issues is that about 40-45% of the voters will always vote against any tax increase, and 40-45% of the voters will always vote to support our schools, regardless of the levy size. I don't know if those numbers are real, but I suspect that they're not that far off. If so, it means that any school levy election is decided by two things: a) who decides to show up from the Always-Yes and Always-No groups; and, b) the 10-20% of the voters who are undecided. I suspect that the reason the levy issue didn't pass in May was that the Always-Yes folks didn't show up in sufficient numbers. But then, hardly anyone showed up at all - fewer voters than we have students in the District. I wish there weren't these huge sets of Always-Yes and Always-No voters. Neither represents healthy democracy in my opinion. It's the reason Congress has become so polarized, making it difficult and frustrating to work anything out. Consequently, the legislation they develop swings from one extreme to the other, passed in one term and reversed in the next. That's got to stop before it tears our country apart. My consistent position over the years I've been writing this blog has been that we need to first educate the community about the basics of school economics and then collectively debate and negotiate until we arrive at a compromise position which an overwhelming majority of the voters - on the order of 80% - will support on Election Day. Instead, we allow ourselves to come to Election Day without having had that period of debate and compromise, and consequently have to live with the unpredictability of an election of voters who make decisions based on ignorance and emotion. So my goal for these many years has been help folks understand the key elements of school economics in the hope that more folks would engage in the debate, and in doing so, provide direction to the School Board as to what they want their School District to be, and how much they're willing to invest to make it so. We still have a way to go, but I feel progress has been made - through the efforts of many folks. Today most people understand that we spend nearly 90% of our operating budget on the salaries and benefits of our team of teachers, staff and administrators. There's nothing wrong with that. In fact, we should want most of the money spent on the people who have the most direct contact with the kids. More of us now understand that when we have discussions about the need for more funding, it's really about how many people we want to employ, and how much they will get paid. It's not about paper clips and stadium lights. It's about people. The purpose of levies is to expand the staff and/or to pay them more. But this time around, there's something different is going on, and it's significant: A radical decrease in State funding. It didn't matter who was elected Governor or who controls the Statehouse, the Governor and the General Assembly were going to have to deal with a budget shortfall in the biennial budget on the order of $8 billion. That shortfall wasn't so much due to excessive spending growth as it was that the US economy tanked, reducing significantly and rapidly the personal and corporate incomes which are the primary basis of tax revenue for the State of Ohio. Education represents one of the three primary spending categories for the State of Ohio; the other two being Medicaid and the operation of our prison system. So there was no question that the State would need to consider making cuts in these three categories to have any shot of closing this huge deficit. That's the reason the Governor is seeking to sell some of the prisons and turn them over to private contractors. I'm not saying that it's the smart move - only that it had to be an option on the table. Likewise, some tough choices might still have to be made in regard to Medicaid. Education took its share of cuts and more. Every school district in Ohio receives some amount of funding from the State of Ohio, inversely proportional to the affluence of the school district, as measured by its collective property values. By that standard, Hilliard City Schools comes out on the more-affluent end of the spectrum, and consequently receives a smaller portion of its funding from the State - about 34% in 2010 (according to the CUPP Report published by the Ohio Dept of Ed). Still, we shouldn't complain - Olentangy spends only 80% of what we do per pupil (because they have lower personnel costs, because their teachers are younger), and still gets only 16% of their funding from the State. Compare that to Hamilton Local Schools which receives 66% of its funding from the State, equal to 1.5x the per-pupil State funding (in dollars) that we receive. The Governor and General Assembly did indeed choose to balance their budget in part by cutting State funding to public school districts, taking more money from the affluent districts than it did the poor ones - and I don't disagree with this approach. Our share of the bill is on the order of $10 million per year, calculated by comparing the amount of State funding we received in FY09 to what we are projected to receive in FY13. I should note that I included the accelerated phase out of Personal Property Tax reimbursements in this calculation. While Personal Property Taxes are technically a local tax in that the revenue is collected from local businesses and distributed the local school district, the tax rate - indeed the very existence - of PPT is set by the state government rather than by local levy vote. That makes it a state tax in my opinion. So what's this stuff about a 1.7 mill levy? It's simply this - at the new valuations of all the properties in our school district, 1 mill of new taxes will collect about $2.375 million/year of revenue. Divide that into $10 million, and you get 4.2 mills. The levy issue the School Board has put on the November ballot is 5.9 mills. That means only 1.7 mills of that money will be used to fund spending growth. The rest just replaces the State funding that has been lost. People have asked me why - if 90% of our spending is on compensation and benefits, and the teachers and staff have accepted a salary freeze until 2013 - do we need any new funding at all? The answer is that our current spending is already greater than our current revenue, to the tune of $3.3 million in FY11, the equivalent of 1.4 mills. So the 1.7 mills is needed to cover that and to preserve a 8% cash reserve, which is still less than our 10% goal. If the community votes to deny this levy, then there is no choice but to reduce spending by at least $10 million per year. The 'cut list' presented is how that spending reduction would be implemented. We'll also go to a Pay-to-Participate fee schedule that I'm sure will deny opportunities to some kids in our community. I for one would not like to see that happen. That's the reason I'll be voting in favor of this levy. I hope you will consider doing so as well. Let me start by apologizing for the length of this article. I'm still learning how to be more concise, but my training is in engineering and business, not journalism. I think this is important stuff, and hope you have the patience to wade through what this 30+ year resident of our community has learned in the past six about community economics. It certainly woke me up, and I hope it motivates you to action as well. Whether you live within the boundaries of the City of Hilliard or not, as a member of the Hilliard City Schools community, the City's new Comprehensive Plan should be of interest to you. 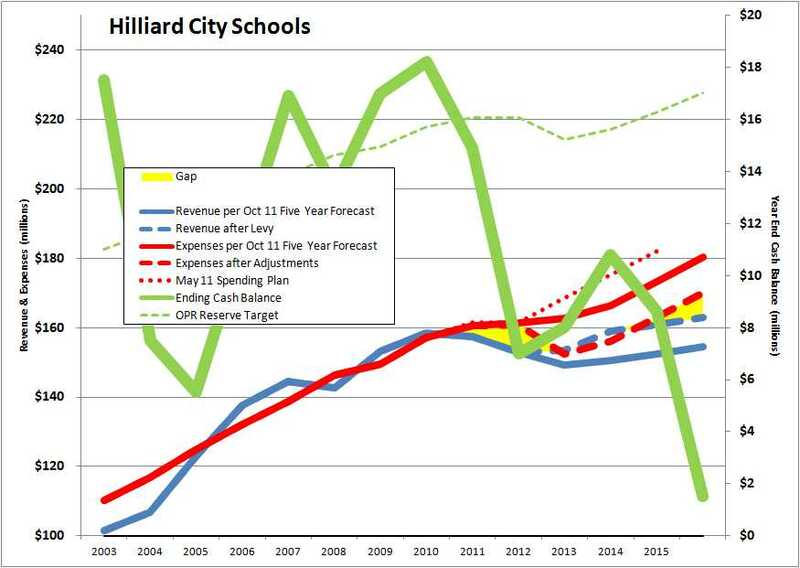 But the first thing to clear up is that the City of Hilliard and Hilliard City Schools are two distinct and separate government entities. The Hilliard City School District is not 'owned' by the City of Hilliard, nor does the Mayor or the City Council have any more authority over the schools than they do any commercial entity within the City's boundaries. The Board of Education of Hilliard City Schools is an independent, elected legislative body, chartered to operated a public school district under the laws and regulations of the State of Ohio. The boundaries of the Hilliard City School district were set by the Ohio Board of Education many decades ago, and have not been expanded since. In fact, the area served by our school district has shrunk in the past 20 years under the terms of the Win-Win Agreement which specifies, among other things, that when undeveloped land in a suburban school district is annexed to Columbus, that land automatically transfers to Columbus City Schools. The best example of this is the large tract north of Hayden Run Rd, between Cosgray and Avery, which became part of Columbus City Schools when it was annexed to Columbus a couple of years ago. City and township boundaries have been shifting more or less continuously since the start of the suburban housing boom in the 1970s, which was triggered by the 'White Flight' that followed implementation of court-ordered busing to achieve racial desegregation in Columbus City Schools. Although our school district has always been comprised of the entire City of Hilliard and some or all of Brown, Norwich, Franklin, Prairie, and Washington Townships, some of the land that was in the townships has been since annexed into the Cities of Columbus and Dublin. The whole purpose of the Win-Win Agreement was to keep these parcels in our school district after annexation into the City of Columbus. This was desired by the homeowners who built homes on these annexed parcels (I was one of them! ), and also by the real estate developers who knew that if their land was reassigned to Columbus City Schools, its value for home building would be about zero. I first became involved in local politics when I was invited to participate in the development of the 2005 Comprehensive Plan for Brown Township (warning: 50mb document!). It was then that I came to understand the connection between the development policies of municipalities and the economics of school districts. If the funding from the State of Ohio, and the taxes generated by new commercial property do not grow at the same rate in which the school district's spending is growing, the incremental funding burden falls fully on the existing homeowners, businesses and farmers in our community. Before anyone starts yelling at me, let me say that I do acknowledge that raising taxes isn't the only way to align revenue with spending. We have to be willing to dig into the spending side too. But let's address that in a later article - this one is about the effects of a city's development policies on a public school district. Because of the current state of our economy, we haven't had to worry about new residential development for the past few years. It wasn't so long ago that we were opening a new school every year. For now the growth pressure is off. Our student census grew from 15,029 kids in 2007 to 15,635 as of last week, an annual growth rate of just 0.6%. But if we wait until housing demand heats up again to talk about the City's development policies, it will be too late. I think we need to talk about this now - while the Hilliard City Council has this new Comprehensive Plan under consideration. The largest remaining tract of land suitable for residential development lies west of Alton-Darby Rd, between Hayden Run Rd to the north and Roberts Rd to the south. Much of this land is already owned by large home builders, notably Homewood Homes and Planned Development. In 2000, the City of Columbus placed this tract in an "Environmentally Sensitive Development Area," and refused to extend water/sewer service into the area until all the municipalities in the Big Darby watershed came together to develop a common agreement for how this area would be developed. That argreement is the Big Darby Accord, and includes all the land between Alton-Darby Rd and Big Darby Creek. I've never quite figured out all the political maneuvering associated with the crafting of the Big Darby Accord, but I know that it was a time of frustration, especially for the developers who wanted to open this tract to homebuilding while the market was hot. I've always suspected that the abandonment of the Grener Property near Homestead Park as the site for our third high school (the school district still owns this land by the way), and the selection of Emmelhainz property was the result of such maneuvering. The Brown Township Comprehensive Plan specifies that this land to the west of Alton-Darby Rd is to be developed in a 'conservation' style, meaning that the typical rural development pattern of single family homes on 5+ acre lots would be abandoned, and instead homes would be arranged in to dense clusters surrounded by substantial open space. The Big Darby Accord repeated this specification, and I'm happy to say so does Hilliard's new Comprehensive Plan (see Chapter 5). It says that the development density will be one home per acre, but with 50% open space. This means 100 houses can be built on a 100 acre tract, but all the homes must be concentrated on 50 acres, and the remaining 50 acres left as open space. What we don't know is if the economics of this will work out for the developers. After all, they have much experience that tells them that people are willing to buy fairly expensive homes sited at 2-3 to an acre, and entry level homes packed in at 4-6 homes per acre. Why would they ever want to leave 50% of their land undeveloped? It's going to take developers who are willing to try something new, and a city government willing to stick by its guns, even if the developers start crying that this conservation development isn't working for them. So why do the rest of us need to care which kind of development approach is used? Because it is one of the primary drivers of future revenue demands, for both the schools and the municipalities! The average new dwelling in our school district will add 0.8 new school age kids to our school population. Since we currently spend $11,475/kid to run our school district, the building of a new house adds $9,180 in new expense (yes, I understand the difference between fixed costs and variable costs). If the average new home costs $200,000, then it will generate roughly $5,000 in property taxes. Who funds the other $6,475 $4,180? It's not the State of Ohio. Even before the State got into its own budget mess, the incremental funding for new students had been approaching zero. In the current biennial budget, the funding from the State of Ohio has gone down - substantially. It's one of the key reasons that there's a levy on the November ballot. Nor are we seeing much new revenue from commercial sources. There has been some, notably the construction of the building housing BMW Financial. But we haven't seen much of that lately, and one of the most promising projects, the Hickory Chase retirement community, flamed out before it was ever occupied, and is currently $1m behind on its property taxes. So the answer is that the $6,475 $4,180 has to be picked up by the rest of us - the current homeowners and business owners in our school district. The deal the City of Hilliard has with the City of Columbus allows the construction of 2,000 new dwellings in the tracts along Alton-Darby Rd. That means 1,600 new kids times $6,475 $4,180, or $10.4 million that we have to subsidize. This would require 4.4 2.8 mills of new property taxes. If the developers chicken out on the conservation development approach and convince the Mayor and City Council that they need to go back to their old way of doing things and the City of Columbus is convinced to provide the necessary water/sewer service, then we could potentially see 10,000 homes built on this tract. That would mean 8,000 new kids, and $52 $33 million in subsidy required, or 22 14 mills! I'll admit that I'm engaging in a little sensationalism. The housing market isn't going to heat up all that quickly, and the City of Columbus is unlikely to provide additional water/sewer capacity to the area until they are assured that someone else will pay for the necessary new main pipelines, water towers, and sewer pumping stations. But we - the people of the community - got caught sitting on our hands during the last housing boom. We ended up with crowded schools and rapidly escalating property taxes as a result. It will happen again during the next rise in housing demand if we don't pay attention to what the Hilliard, Dublin and Columbus city governments intend to let happen within the boundaries of our school district. 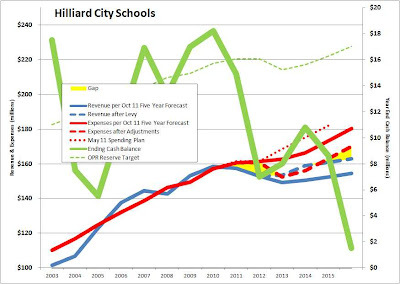 Another thing we need to pay attention to is the use of Tax Increment Financing, or TIFs, by the City of Hilliard. This is a mechanism made available by the State of Ohio to municipal governments. It allows the municipality to redirect the property taxes on a new development, whether commercial or residential, to fund infrastructure projects in the municipality. This would be all well and good if the redirected property tax revenue would otherwise go to the city anyway. But it doesn't - it's not their money! Rather it's the key revenue source for the local school district and other agencies. In our community, that includes the Norwich Twp Fire Department, which provides fire/safety services for many of us. So many of us on the School Board were alarmed when the City of Hilliard granted a TIF to Schottenstein Homes for their new residential development at the corner of Alton-Darby Rd and Roberts Rd. That TIF was used to fund the construction of the new realignment of the Roberts/Alton-Darby intersection. In other words, revenue was taken away from the school district to pay for a road. The last I checked, public roads are the responsibility of the City or the County - not the school district. Several members of the School Board let the Hilliard City Council know that we objected to this use of our revenue. I made comments during the City Council meeting when this TIF was being considered, stating that this was a bald political maneuver - allowing the City to get a new road at the expense of the School District, essentially making the School Board be the bad guys for raising taxes. The Norwich Township Trustees also spoke at this City Council meeting, making substantially the same point. In their new Comprehensive Plan, the City of Hilliard makes it clear that they intend to continue using TIFs. TIFs aren't a new thing for the City of Hilliard, but they are being configured in a new way. The law says a municipality may redirect up to 75% of the property taxes without permission of the affected school district. In the past, TIFs have been like the one granted to BMW Financial, in which the School Board gave the City of Hilliard authority to grant a 100% TIF, but the TIF agreement specified that the school district would receive 100% of the revenue it would have otherwise received. This one for Schottenstein Homes is different. The City granted a 75% TIF - which it can do without permission of the school district - for the multi-family part of their development, but will not attempt to keep the school district whole. This is why I say that the school district is funding the new Roberts Rd connector. I recall hearing the City leaders state that the multi-family part of this Schottenstein development would be for folks aged 55+, like their Tremont Club development, and therefore would not be bringing new kids to the school district. That made the TIF a little more palatable. But those plans have apparently changed. Instead, Hilliard Summit is to be an apartment complex without age restrictions. The web site even shows a photo of a couple with young children. So it seems to me that not only is the school district losing out on critical new funding, there is also the potential that a number - maybe a large number - a new kids will come from this development. In today's real estate market, more families are choosing to rent rather than buy a house, and upscale apartment complexes in desirable school district may be in high demand. So the school district might get double-screwed in this deal: no new tax revenue and more kids. And that means even more tax burden on the rest of us as we subsidize the cost of educating those kids. As much as I've complained about the City of Hilliard in this article, the City of Dublin has its own strategy to protect its economics at our expense. At a meeting last year at Bradley High School, a representative from Dublin's planning department told us that Dublin's master plan keeps all new commercial development in the Dublin school district, and puts only residential development in the Hilliard school district. So we get the kids, and they get the commercial revenue. Thanks for being good neighbors. By the way, their school district's service facility and bus garage is within the boundary of our school district, as is Upper Arlington's. In both cases, they're occupying valuable land zoned for commercial uses, but as government entities, pay no taxes to our school district. Meanwhile, they preserve their own commercial land for revenue-paying businesses. The City of Columbus is often painted as the bad guys in these matters. But we have to remember that while there has been about the same amount of residential development in the Columbus part of our district as there has been the Hilliard part, the amount of commercial development in the Columbus part has been double that in Hilliard. That whole huge retail zone at the intersection of Hilliard-Rome Rd and Trabue/Renner is in our school district, and it is contributing a substantial amount of funding to our operations. A couple of new members will be sworn onto the Hilliard City Council this January - Nathan Painter and Joe Erb. Nathan was a member of our school district's Audit and Accountability Committee, and through that process had the same kind of awakening I did to the realities of the school district economics, and the role the municipalities play in helping create economic sustainability for the schools. His voice on the City Council will be vital. But it is also vital that you understand and speak up about these things. Our school district can't raise new revenue by any means other than asking you to raise your taxes. Only a municipality, like the City of Hilliard, can control how and at what pace our community develops. If they make sure that there is plenty of new commercial development to subsidize the cost of all the kids that come with new residential development, then our school district has a chance. If however, the City of Hilliard just allows thousands of new residences to be built without corresponding commercial development, the tax burden on all of us will continue to escalate. Or the breadth and quality of programs offered in our school district will continue to diminish. The only winners will be the real estate developers and their friends. 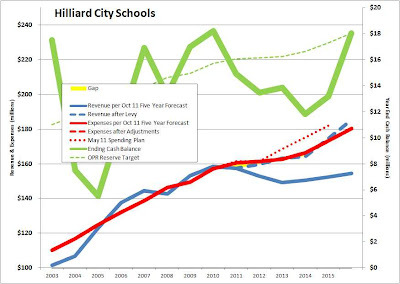 Meanwhile, if the City of Hilliard wants any more new roads or water lines or sewers, let them raise taxes to pay for them and quit using the school district as a piggy bank. Notice is hereby given; there will be a SPECIAL meeting of the Board of Education of the Hilliard City School District on MONDAY, AUGUST 22, 2011 at 5:00 P.M. located at the Hilliard City School District Administration Annex, 5323 Cemetery Road, Hilliard, Ohio. The meeting will be a work session held in regular session to discuss regular business as deemed necessary by the Board of Education and any other business that may be lawfully considered. The regularly scheduled meeting will be held immediately following the special meeting and will begin at 7:00 P.M.
At the Aug 8 School Board meeting, this draft "cut list" was presented by the Administration to the Board. It is the Administration's top-level recommendation of what should be eliminated from programming and services should the operating levy issue fail in November. I'll write more about this as soon as I have the opportunity, but wanted make sure all of you saw it. Again, this is a draft version - the final version will be determined after further information gathering and discussion by the Board. I'd certainly like to hear your thoughts before that discussion takes place. Please keep your comments civil and productive. I'd also like to impose this rule: If you want to see something taken off the list, then make a recommendation for what programs/services of approximately equal cost should take its place. And please indicate whether you have any "skin" in your answers (ie you now, or will likely have a kid involved in whatever you advocate keeping/cutting). ... and select "Name/URL", then in the dialog box that comes up just fill in the "Name" box with something unique (and tasteful!). 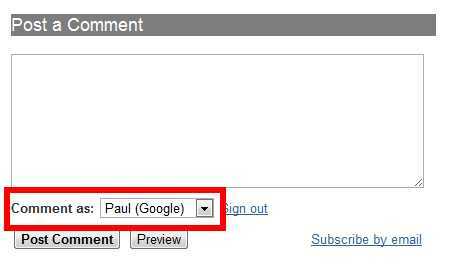 You can leave the "URL" box blank. You'd have to be living under the proverbial rock to not know that there is a battle royale going on in our nation's capital in regard to raising the Federal debt limit. And I'll go on record as being one of those who believes that if the US Treasury defaults on its obligations, it would put our country on a path with known and completely unexpected consequences that will negatively impact us for a long time - maybe a generation or two. Maybe forever. Nonetheless, the resolution to this situation is not in our hands. It will or will not be settled by our elected representatives - all we can do is watch and decide whether or not we'll vote for their re-election next time they're on the ballot. We can be confident that each and every one of the 535 members of Congress, as well as the President, are looking for ways to collect favors and make side deals that don't often get put on the table except in a high stakes situation such as this one. I'm not particularly surprised that they're waiting to the last possible second to close their deal-making, because some the of side deals will get better the closer to the deadline we get. I'm highly confident they'll figure something out before a financial meltdown. Otherwise I'd be buying all the gold I could afford right now. In a little more than three months, we'll be in an analogous situation in our community - trying to deal with the tough issue of a school tax levy. But the process is different in a significant way: you - the members of the community - get the last vote. 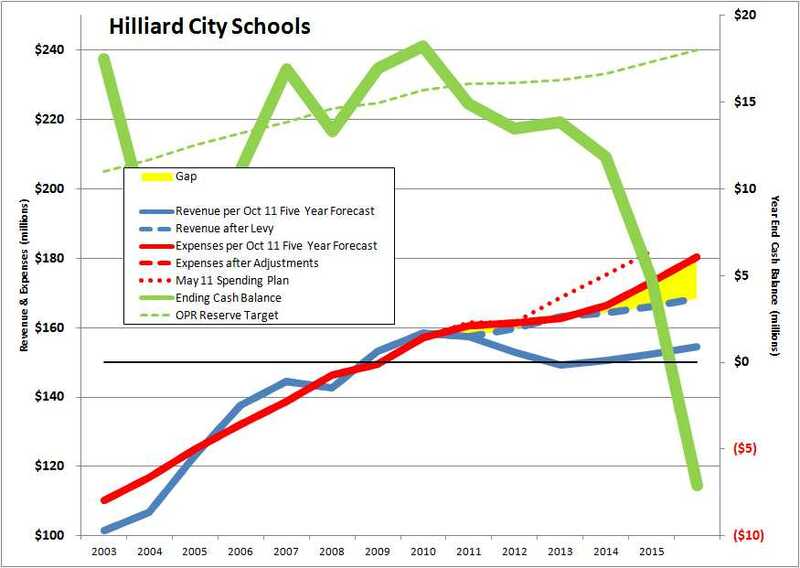 Within two weeks, the Hilliard School Board needs to submit the resolutions necessary to put a levy on the November ballot, with the first step taking place at the special August 1 meeting, followed by the resolution to place the issue on the ballot, which is planned to be on the agenda for the regular August 8 meeting. At that point, the "knob-turning" debates will be over, and the levy size will have been selected. In terms of formal process, at that point the School Board is out of the levy game for this cycle. Then it will be up to you - the voters of our community - to decide whether or not the right number has been nominated by the Board. Or more precisely, we'll find out whether the 50%+1 of the voters who bother to show up can live with the levy size the School Board has settled on. The rest of the community will have to live with their decision. It's too bad it comes down to this set of YES/NO decisions, first by the School Board, and then by the community. Whatever number the School Board nominates will be too much for some, not enough for others, and about right for the rest. But the levy either passes or it fails. Wouldn't it be interesting if Ohio law allowed for multiple-choice levy options. We could for example make the choices 0, 4, 8 and 12 mills, and each voter picks the levy size acceptable to her/him. Then the levy put in place would be the one with the most votes. Or perhaps better would be to use a weighted average - if 10% voted for 0 mills, 50% for 4, 30% for 8 and 10% for 12, the levy that gets enacted would be 5.6 mills. The best thing about that kind of approach is that the matter is settled on election day. A levy of some size will be enacted, allowing the Board and Administration build a budget where spending fits the revenue. But that's not the way it works. On election day, the voters will have one choice, and the levy passes or it fails depending on tally. Either the full amount of new funding is provided, or none at all. If it fails, cuts are made, and the whole process starts over. That's not to say the Board and Administration still doesn't have work to do. The cost of compensation and benefits will always drive the economics of our school district, and this the product of the salary and benefits cost times the number of employees. Using the data published in the 2010 Comprehensive Annual Financial Report, the number of students per full-time employee equivalent* has dropped from 10.28 in FY01 to 9.79 in FY10 (however, the relationship between students and Regular Classroom Teachers has remained fairly constant at 20 to 1 during that whole decade). The change from 10.28 to 9.79 may not sound like much, but if the 10.28 for FY01 were kept constant through FY10, the total number of FTEs* employed today would be 75 less (23 fewer teachers/tutors and 52 fewer in other roles). If the average cost of an employee is about $80,000 (per FY10 numbers), then 75 people cost $6 million/yr. As I have said, the new union agreements go a long way toward holding down our spending growth, and the I'm thankful for that. That was a "big knob," and the most important knob to turn in this process. Now we have to start looking into finer detail. And the community needs to tell the School Board how much more it is willing to contribute to funding its public school district, recognizing that the State of Ohio has reduced its funding to us by the equivalent of 3.3 mills. ** In other words, a 5.9 mill levy would replace the 3.3 mills the State has taken away from us, and provide 2.6 mills of new funding. * Because the method for counting Full Time Equivalents (FTEs) for bus drivers changed dramatically in the past few years, bus drivers have been excluded from this analysis. ** In FY09, our state funding was primarily made up of $37m in Unrestricted Grants, $18m of reimbursement for state mandated property tax rollbacks and the phase-out of Personal Property Tax (PPT). Actual PPT collection in FY09 was $8.5 million, making the total state funding approx $64m. For FY12, the Unrestricted Grants will be $34m, reimbursement will be $19m, and actual PPT collection will be $3.8m, making the total $56.7m, or $7.5m less than in FY09. Since each 1 mill of property taxes will generate approximately $2.3m/yr, the loss of state funding is equivalent to 3.3 mills of local funding.